During our trip to Boston, we spent one evening across the Charles River in nearby Cambridge. 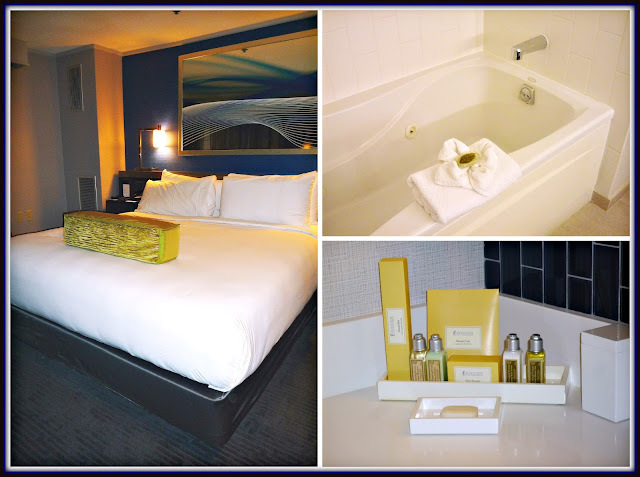 Our home base for this portion of our trip was the modern Royal Sonesta Boston. This gorgeous newly renovated 400-room property is located right on the Charles River, and it offers gorgeous Boston city views! The check-in process in the Sonesta's sleek lobby was very quick and simple, and we were on our way to our room. Our Executive Suite River View featured pretty Boston city views across the Charles River, a spacious living area that came with a large dining table, and a comfortable bedroom. 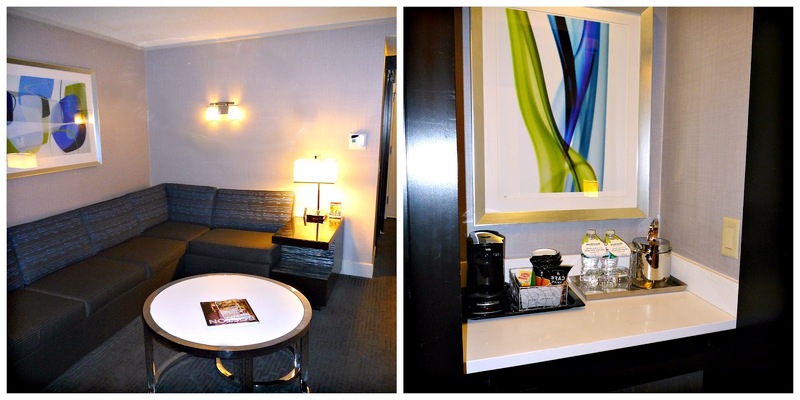 We felt like we were staying in an urban studio apartment rather than a typical hotel room! The bed was very comfy, and the linens were so soft! The suite's large bathroom featured a deep soaking tub and fragrant spa toiletries. The little touches make all the difference, so we were delighted to find some welcome treats waiting for us on the bar area between our bedroom and living area. In addition to perfectly chilled bottles of artisan Voss water, we were provided a platter of chocolate-dipped strawberries, hand-dipped artisan chocolates, and a colorful fruit display. After we settled in, we hopped in a cab and headed back into Boston for brunch at Davio's Northern Italian Steakhouse. 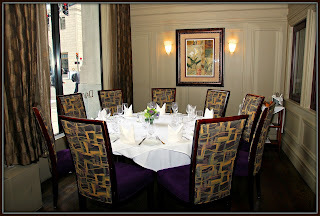 When we arrived at Davio's, we were warmly greeted and showed to our table. 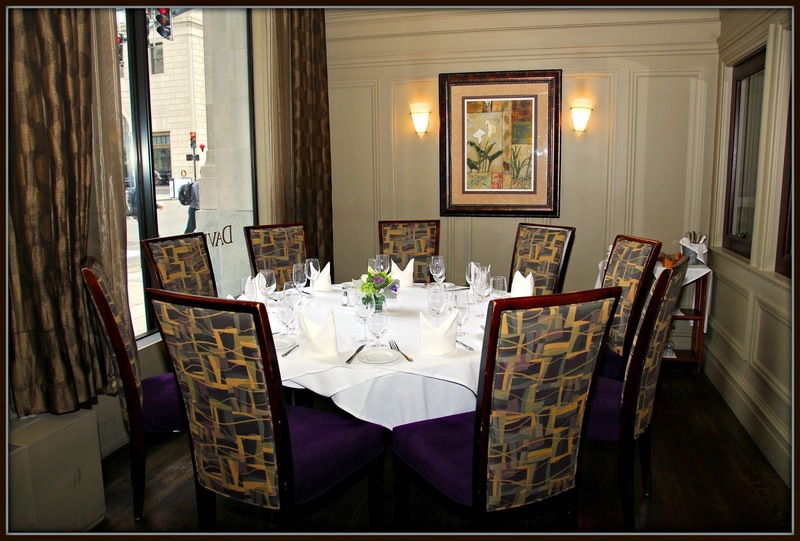 We were immediately impressed with the elegant decor in the main dining room. The vibe was more like dining in someone's elegant home than a typical restaurant. We started our meal with a duo of cocktails. Michael sampled Davio's fun signature create-your-own bloody Mary cart. I opted for a seasonal Pumpkin Pie Martini. Both drinks were just strong enough and excellently prepared. As we sipped our drinks, we shared the creative and tasty Spring Roll Sampler, which featured five flavors: Philly Cheese Steak, Chicken Parm, Buffalo Chicken, Shrimp Cotija, and Reuben. The flavors of the perfect fried spring rolls were robust, and each was paired with a tasty dipping sauce. Our brunch was off to a great start. 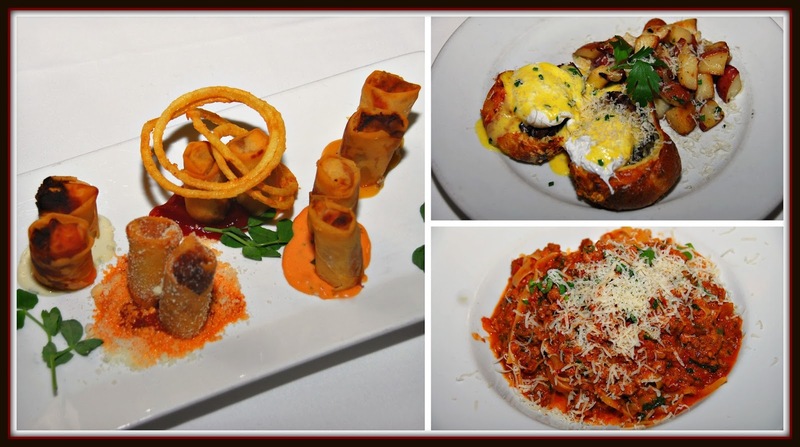 For our entrees, we selected a pasta entree and a steak entree since those are Davio's two signature menu items. Michael opted for the beef tenderloin served inside of a popover. It was topped with a poached egg and decadent truffle hollandaise sauce. I selected Davio's specialty: Tagliatelle Bolognese topped with braised veal, beef, and pork tomato sauce. Both entrees were expertly prepared delicious. Michael's tenderloin was fork tender, and my pasta was positively decadent. The slow-braised sauce was deeply flavored and luscious. After savoring our entrees, we looked over the dessert menu and selected on a duo of delicious desserts: Vanilla Bean Panna Cotta with Berries and Chocolate Chip Banana Bread Pudding. OMG...these desserts were DIVINE! The panna cotta was rich and creamy, with definite flecks of vanilla bean. The sweet-tart berries provided the perfect textural and flavor contrast to the silky smooth panna cotta. The bread pudding tasted like chocolate chip cookies and banana bread had a love child! It was warm and comforting with pockets of melted chocolate. The drizzle of caramel sauce and vanilla ice cream were perfect pairings to the bread pudding. We especially loved that these desserts were the perfect portion size to enjoy without being overly stuffed at the end of our meal. We thoroughly enjoyed our brunch at Davio's and consider a must for any Boston trip! After brunch, we headed back to the Royal Sonesta Boston to relax and explore the property. Before we knew it, it was time to get changed for our dinner reservation at nearby EVOO Restaurant. It was fun to sample the goodies that the hotel had left for us earlier in the day...and they were all decadently delicious! The hotel offers its guests a wide range of convenient amenities, including a CD clock radio, flat-screen high-definition televisions, complimentary WiFi internet, fridge, and electronic safes. Before we knew it, it was time to hop into a waiting cab in front of the hotel entrance and head to dinner. EVOO is an award-winning New American restaurant that features organic, local, and sustainable ingredients -- with a menu that changes daily. We were warmly greeted by the restaurant's manager and shown to our table. Our dinner tasting was a fabulous experience -- the food was expertly prepared and whimsically presented. 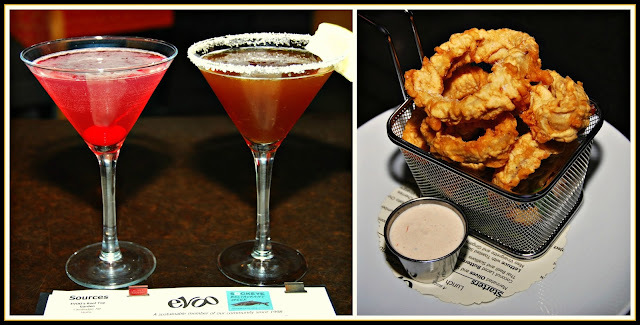 Our dinner tasting started with flavorful artisan cocktails and a shared appetizer of Beer Battered Picked Onions from the Small section of the EVOO's dinner menu. The were like ordinary onion rings on steroids! The batter was light and crispy and the rings were perfectly fried. One bite revealed that the onions inside were lightly pickled -- which provided a mildly tart flavor. The creamy sauce served on the side for dipping was delicious -- and the presentation in a small fryer basket was really fun. Our meal was off to a fun start! Next out of the kitchen came one item from the menu's Medium section and two items from the Large section. From the Medium section, we shared the very creative Chinese Box, which featured a Chinese food takeout box filled with Mustard-Glazed Shrimp, Hoisin Braised Beef, Gingered Vegetable-Cashew Salad, and Organic Brown Rice. When the server brought the dish to our table, he unmolded it upside-down from the box onto our plate. Not only was this dish fun, it was insanely delicious! 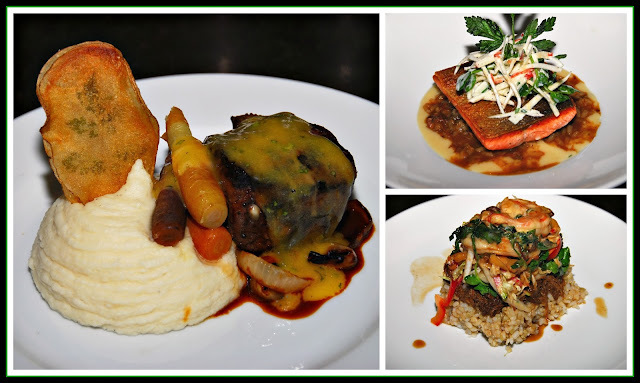 For our Large menu items, we opted for a beef dish and a fish dish. Michael selected the comforting Garlic and Parsley Studded Beef Tenderloin with Sweet Onions, Carrots, Sour Cream Whipped Potatoes, and Orange Béarnaise. The tender beef was expertly cooked, and the sauce had a mild citrus taste. The mashed potatoes on the side were rich and creamy. This is a perfect selection for carnivores to enjoy. Our fish was expertly seared -- crispy outside and perfectly moist inside. 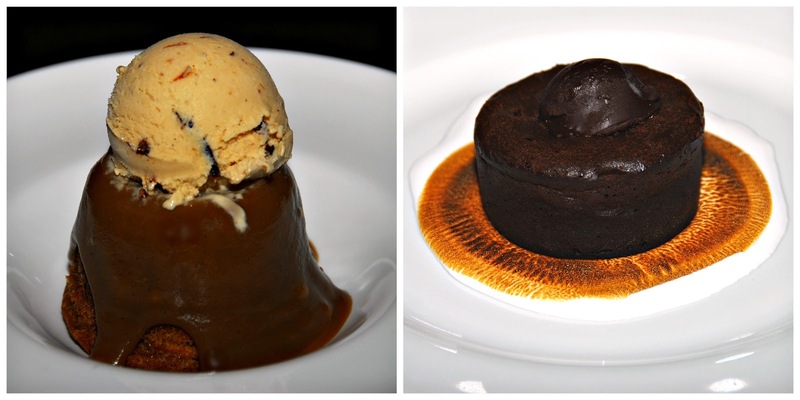 For dessert, we chose two decadent menu items to share. The uniquely delicious Figgy Cake with Sticky Toffee Sauce and Pedro's Prune-Armagnac Ice Cream is one of the most interesting desserts I've tasted in ages. The cake is supremely moist, the sticky toffee sauce is richly sweet, and the ice cream? It's positively divine! Even if you're not a prune fan, this rich ice cream will knock your socks off. For chocoholics, the Warm Chocolate Truffle Cake with Toasted Marshmallow Cream is a definite must try dessert! It features a decadent warm chocolate cake with a melted truffle center. The cake comes served in a generous pool of toasted marshmallow sauce. Insane! With that, our EVOO dinner tasting was over. Even if you're staying in Boston for your trip, EVOO is definitely worth a quick cab ride to Cambridge for dinner. We were very impressed by the quality and creativity of the food we tried. After we finished our meal, the manager of EVOO had a cab waiting outside for us to make the quick trip back to the Royal Sonesta Boston. As I mentioned previously, the little touches really make all the difference during a hotel stay. 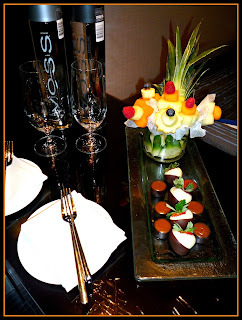 When we arrived back to our suite, we found a little surprise waiting for us in our bedroom. 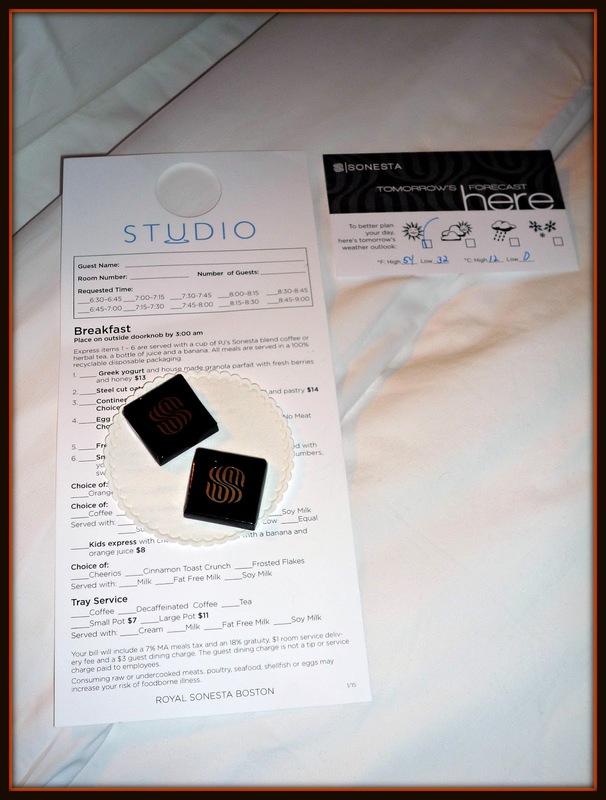 There was a menu card for us to order room service breakfast if we chose to, a pair of chocolates, and a thoughtful card that provided the next day's detailed weather forecast. After a soak in the bathroom's large soaking tub, I slept great and woke up feeling totally refreshed. 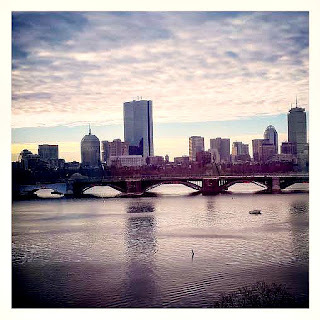 We enjoyed the morning views of Boston from our room and took our time packing up our bags. Before we knew it, it was time for us to check out. As we walked from our suite to the lobby area, we admired the hotel's modern, colorful decor -- and all of the natural light the Royal Sonesta Boston has during daylight hours. 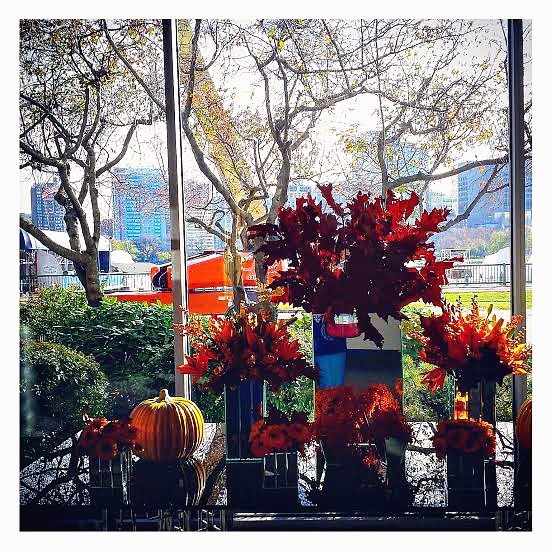 Before leaving the hotel, we stopped to admire the beautiful, colorful floral display that was in the lobby area. While you're staying in Cambridge, make sure to visit some of its most popular attractions. Within minutes of the Royal Sonesta Boston, you'll find Harvard University, MIT, and the Museum of Science. The waterfront located adjacent to the hotel is perfect for walking, jogging, and rollerblading. If you enjoy shopping, you're in luck too! The Royal Sonesta Boston is located directly across the street from the CambridgeSide Galleria. It's a quick 3-minute walk across the street, making it very convenient! Disclosure: The Royal Sonesta Boston provided us a hosted overnight stay to facilitate inclusion in this article. Davio's in Boston and EVOO in Cambridge hosted us for a complimentary dinner tasting as well. All opinions expressed are solely my own, and all photographs are copyrighted by Michael K. Garcia. They may not be used or otherwise copied without prior permission.